What makes a something a really good read? Sometimes it's the writing – some writers can turn anything into a page-turner. Sometimes it's the subject – newspaper accounts often lack artistry, but the facts themselves grab and keep our interest. And sometimes it comes down to the purpose of the piece. I've reviewed novels that didn't cut it as entertainment, but that was okay, because their main purpose was education. And this packaging of education as fiction made learning much more enjoyable than this same material would have been, had it been in textbook form. So for learners, these novels would be really good reads. 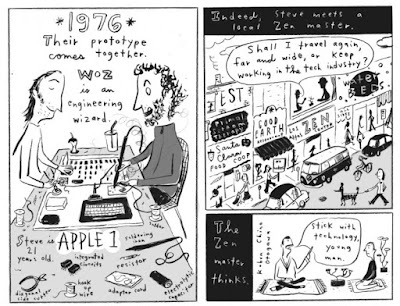 Now Steve Jobs: Insanely Great as a graphic novel biography is only middling. But if read to a different end, well, this is an absolutely fascinating account the tech industry's development from 1960s through the 2000s. I picked this up because I am a bit of an Apple fan based solely on the fact that my two Mac desktops both lasted twice as long as any of the five PCs that preceded them. I appreciate quality. And that had me curious about the man who started it all – surely there must be lots to learn from a man who turned his home-based business into one of the biggest companies on the planet! But as it turns out, in Jobs' life there are more examples of what not to do than examples worth imitating. He was a genius, undeniably, but genius is something you either have or don't. He was driven, and I think most of us could benefit from being a little more driven, but not like Jobs. He abandoned his young daughter for a time because she got in the way of his pursuits. So yes, he was self-absorbed, and also impatient; he smoked pot, and invented and sold a device which stole from the phone company. I'm not trying to say Jobs was some sort of horrible person. It's only that I generally read biographies for examples who will challenge and encourage me. And this is not one of those sort of biographies. For a generation that grew up with the Internet, and smartphones, and Netflix, it might be hard to imagine a world with computers. But when Jobs was a born, personal computers hadn't yet been invented, and business computers were the size of buildings even though their computing power wouldn't match today's most basic calculator. 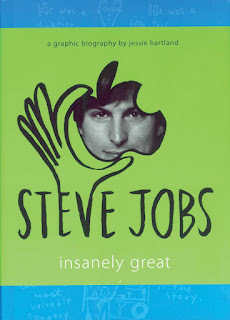 In this account of Jobs' life we also get an insider's look at the development of the personal computer, and all the technology that spawned. As we go from decade to decade, author Jessie Hartland occasionally interrupts the story to provide a two-page spread on the technology of that time. For the 1960s, it was the record player, transistor radios, rotary phones and black and white TVs with no remote controls! And what a leap we see, in just a decade – in the 1970s there are color TVs, now with remote controls, and the first video game consoles have been invented. Invention after invention, we see it all progressing forward to our modern day. You might have to be a bit of a geek to like this, but that's all it would take – just a smidge of nerdy DNA – for anyone to enjoy this as a history of the tech industry. 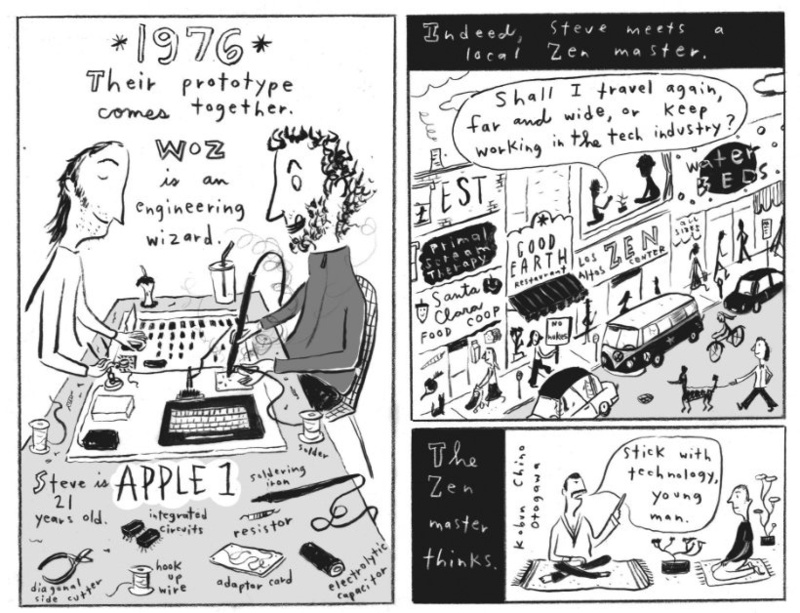 There is passing mention made of Jobs interest in Zen mysticism, and as noted earlier, it shares that Jobs also smoked pot. So this is not one for young readers. But the style of the pictures, and the large amount of text means they wouldn’t pick this up anyway. Graphic novels are often a great means to grab reluctant readers, but I will note this is not that sort of graphic novel. It is much more book than comic, with a lots of text, and the illustrations, while helpful, are not the eye-catching, action-packed sort of visuals that will draw the casual reader in. So who would love Steve Jobs: Insanely Great? I’d recommend this to older teens and adults who have an interest in computers and technology. For them, this will be really fun, informative, and readable. I know I enjoyed it immensely. 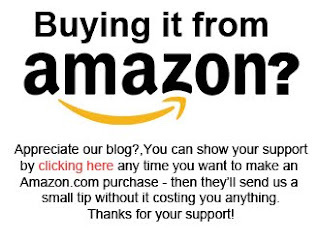 Support our efforts. 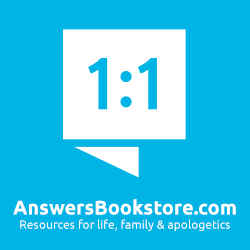 If you use our links to Amazon.ca or Amazon.com to buy this or any other book, they'll send us a dime or two at no cost to you.